Sometimes sous chefs at fancy, expensive restaurants decide to become executive chefs at smaller, more casual restaurants. It’s a choice for life-style and freedom. When it happens, we (the customers) win! We get that same talented chef cooking for us at a fraction of the cost; plus no six-month wait for reservations. Finding these situations are like discovering gems. 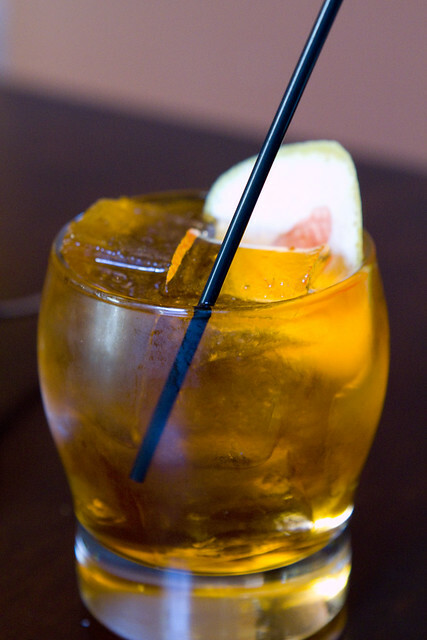 That’s the story at Fat Goose 125 Wythe Avenue, Brooklyn, NY 11249, where the atmosphere is warm and understated. The simple decor does not prepare you for the expertly made cocktails and beautifully presented plates. Though they call the cuisine “New American” the influences draw from two very different regions. Chef Jennifer Cole draws inspiration from her origins of North Carolina as well as Spain, where she spent most of her career. After working with impressive names such as Susan Spicer, Juan Mari Arzak, Andres Madrigal, and more, Chef Jennifer Cole was named “best female chef” in Madrid for her work at Ene. 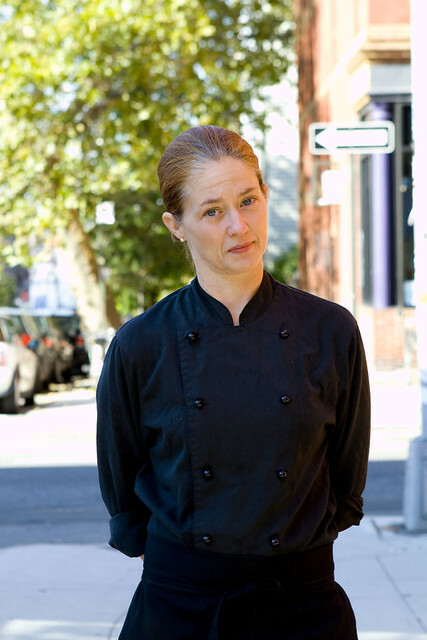 And now we can taste all of that in her food, right here in Williamsburg. 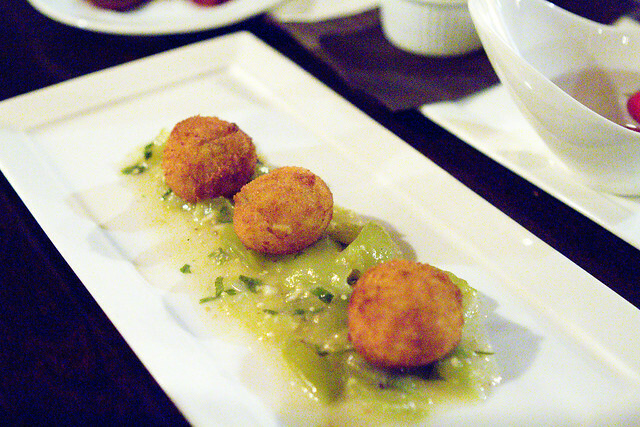 When you go to Fat Goose, you must start with the Chicken Croquettes with Tomatillo Salsa. Most of the croquettes I’ve had here are potato-based. These, done like they do in Spain, are bechamel-based and ooze once you crack the thin crisp shell. Warm and comforting, the chicken-y richness floods your mouth. The tomatillo salsa add just the right touch of acid. The next dish was a Salmon Tartare presented with a raw quail egg yolk on top. It was a nice fresh dish, the perfect prelude to the richer Red Wine Stewed Oxtail with Toasted Pasta. The intense umami is brightened with a sweet carrot marmalade. I didn’t need as much marmalade as Lon who can take a stronger sweetness than I can. 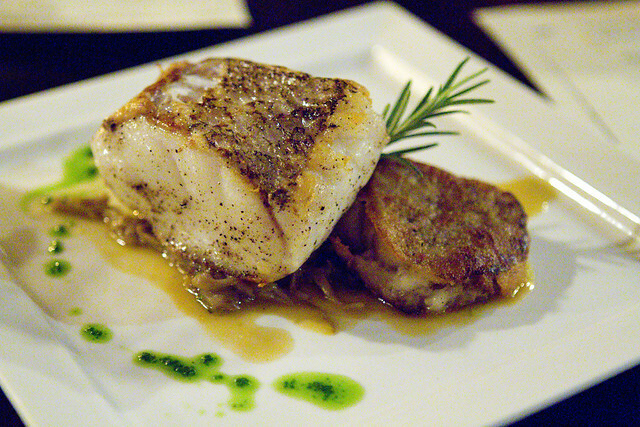 The Hake with Heritage Pork Trotters and Wild Mushrooms was another favorite at our table of six. The fresh bounce of good fish reminiscent to the “fresh-kill” common in Chinese food was a nice match to the collagen rich slice of pork trotters. The mushrooms made this such a complete dish. By that point in the meal we were getting quite full, yet I still tried desperately to finish the beautiful cut of pork belly resting on creamy Rosemary Polenta. We gave in but took the mere three bites home. 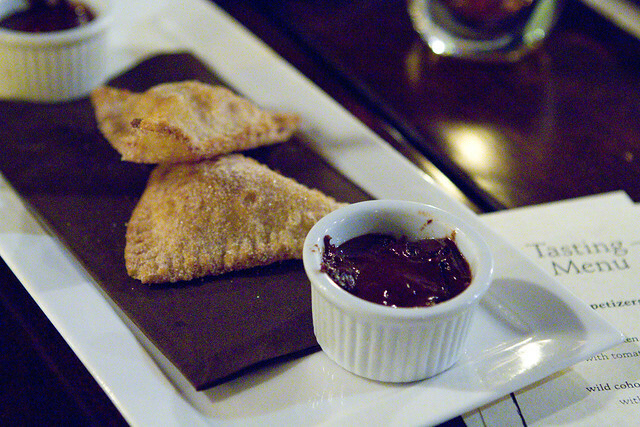 We still had the Rice Pudding Empanadas coming. Piping hot, not-too-sweet, and served with a dark chocolate sauce. There was nothing wrong with the dessert, but it was our least favorite of the night (something had to be). We enjoyed that dinner so much, we went back for brunch as patrons. For this meal, we met up with our friends Bill and Lee, and Caya was with us. It’s a nice chill place to go with friends and family. Again, no wait yet! Bill was very happy with his Heavy Sunrise cocktail x2. As I already advised to you (above) we started with those Chicken Croquettes (also available at brunch) and Deviled Eggs. We typically think of deviled eggs as the house-party dish we avoid, but Chef Jennifer worked some magic with these. They’re more like a very fresh and admittedly artery clogging salad just held in a halved egg white. I was ecstatic about the Buckwheat Crepe. Every bite melts in your mouth with an even distribution of creamy spinach, toasty pine nut, and dabs of sweet raisin. I would go just for this. The Fried Egg “Nest” was a pile of nicely fried potato rounds a bit thicker than chips. A perfect runny egg sat in the middle. Unfortunately for Lee, the dish was under-seasoned and felt like it was missing something. Lee, Bill, and Lon felt the menu description didn’t accurately represent the dish that was served. 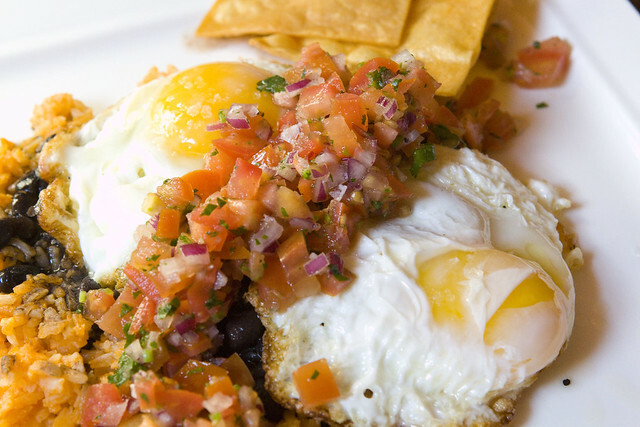 The two boys ordered Huevos Rancheros, a generous dish, but not otherwise note-worthy. 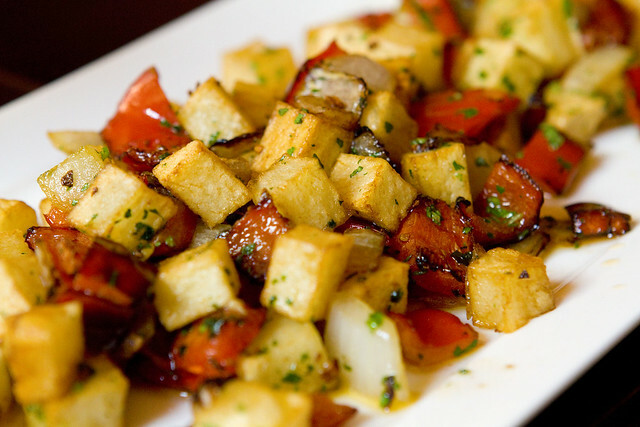 A side of Goose Fat Hash is beautiful and a nice plate to share. Lon was super sad they were out of Cured Ham Biscuits. 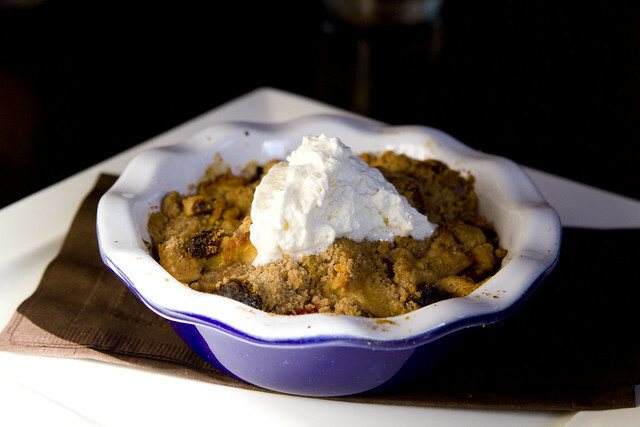 We finished with a lovely fruit crumble. Simple good ingredients. 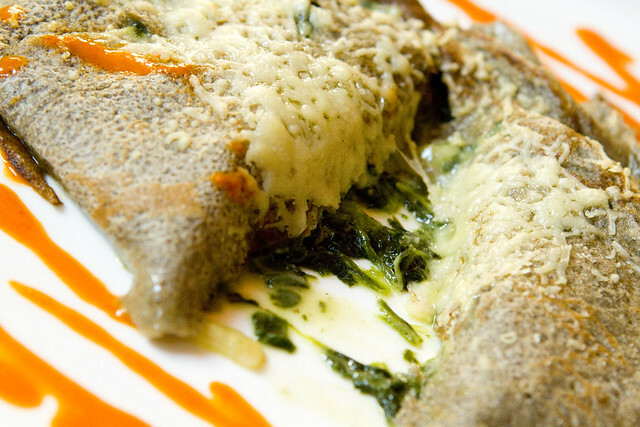 It seems like Fat Goose is still working out the kinks in brunch service, so we recommend going to Fat Goose for dinner for now, unless you just want to stop in for that Buckwheat Crepe. posted by jessica	at 11:42 AM	Filed under American and New American, Favorites, Fusion or Mixed, Restaurants. You can follow any responses to this entry through the RSS 2.0 feed. Both comments and pings are currently closed. I’ve often wondered how to write an honest review and still maintain decorum. You did a a good job in pointing people to the right eating direction. It’s often the case that good dinner places can’t do brunch and then folks are turned off to the whole restaurant. Geez…what a lovely place this one seems to be…can’t wait to try it! Hi Jess! I am adding Fat Goose to my immediate to do list – for dinner 🙂 I have missed your restaurant reviews. yay – they are steadily coming back! Angela, I wouldn’t say they can’t do brunch, just dinner is more impressive. JL Rivers, let us know what you think. Thanks Amy! Thanks for the tweet too! I have set a goal of 4 posts/month now. Fingers crossed! 4 posts/month is a good goal…and I’ll bet once you start rolling more & more & more ideas will be waiting to get done. Sounds like a wonderful place and a great addition to my former stomping grounds. Nice piece and beautiful photos! Think I remember Chef Cole from an appearance she made on Chopped. Obviously memorable. I loved her take on her preparations. Ian, Chef Cole was on Chopped and won! This sounds like a lovely restaurant to dine & wine in! Thanks for this tasty review!